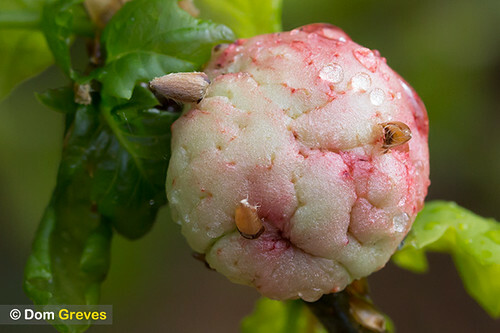 Oak trees are home to more than 30 species of gall wasp. The larval stage of these insects induce the plant to produce abnormal growths, known as galls, which enclose and protect them as they develop. Galls come in a variety of fantastical shapes, each unique to particular species. Hard woody spherical galls up to 25mm in diameter on the oak stems. Initially green but later become brown. 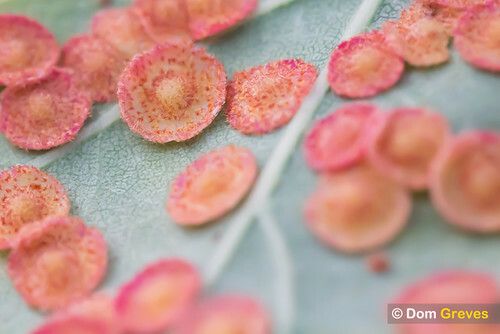 These galls have a spongy texture and are brownish white, tinged with pink. 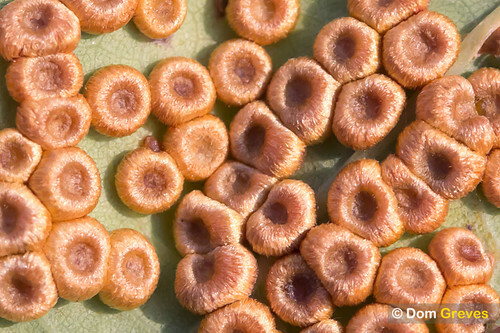 Yellowish gingery brown disc-shaped galls on the underside of oak leaves in late summer and early autumn. 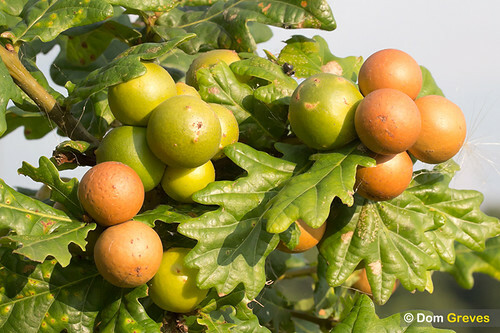 Golden brown discs with a depressed centre on the underside of oak leaves in late summer through to early autumn. The acorn becomes a ridged woody structure. The gall is initially yellowish green and sticky but later greyish brown. 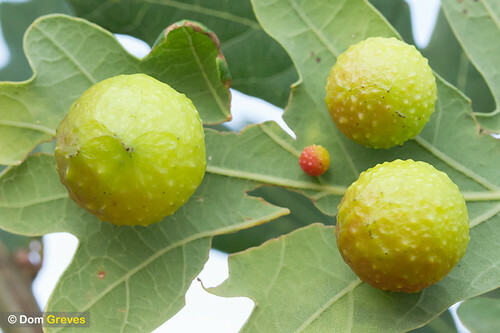 Yellowish green or red spherical galls up to 20mm in diameter on the underside of oak leaves in late summer and autumn. 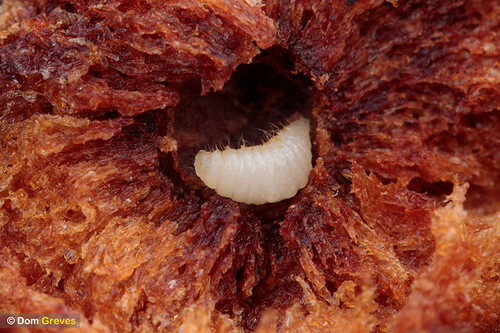 Oak gall wasps have complex life cycles, with alternating generations that are either sexual with males and females, or asexual with females only. 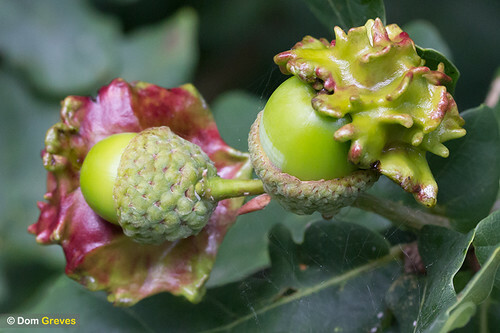 The two generations of wasp often produce different types of gall on different parts of the tree, and in some species the two generations alternate between native and non-native species of oak. There are also wasps which specialise in injecting their eggs into oak galls. Their larvae then eat the resident eggs or larvae before they emerge. 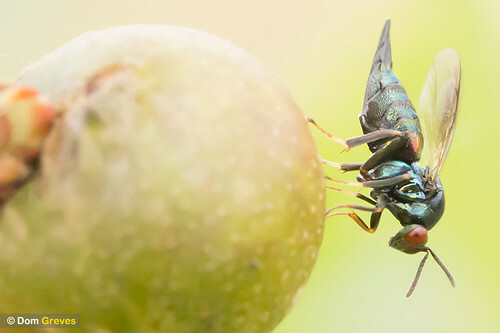 The example above shows a type of Chalcid wasp investigating a fresh oak marble gall.